Nagorno-Karabakh’s military has allowed the Azerbaijani side to continue their search for dead soldiers to the north of the line of contact as ceasefire reached verbally on April 5 mostly held over the weekend. According to Nagorno-Karabakh’s Defense Ministry, permission was given after mediation of the International Committee of the Red Cross and the personal representative of the Organization for Security and Cooperation in Europe’s Chairman-in-Office. Earlier, the Karabakh authorities reported that during engineering work carried out by Defense Army units at the line of contact a body of an Azeri soldier was found. Later, they specified that it was an “unidentified object” that “resembled” a body, adding that verification was needed. Scores of Armenian and Azerbaijani soldiers were killed and wounded in April 2-5 clashes – the fiercest since the 1994 ceasefire in the conflict zone. Under a related agreement the two sides conducted a search for the dead for several hours on April 8 in conditions of full enforcement of the ceasefire regime. Meanwhile, on Saturday, the Defense Army reported that one Armenian serviceman was wounded in the shoulder while on combat duty. Both Stepanakert and Yerevan accused Azerbaijan of continuing violations at the borders. 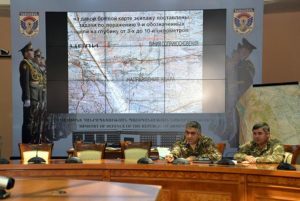 Over the weekend, Armenian Defense Ministry officials also published evidence obtained from a downed Azeri helicopter suggesting that the goal of the Azerbaijani offensive on April 2 included the capture of the strategically important town of Fizuli to the southeast of Nagorno-Karabakh. 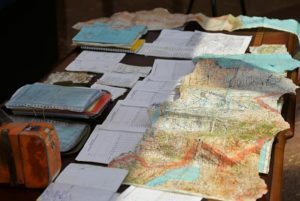 Advancement by a total of 10 kilometers inside the line of contact had been planned, according to the maps and other documents obtained from the Mi24G wreckage. Also, the arrival of the combat helicopter to the area near Nagorno-Karabakh several days before the attack and its having precise targets, according to the Armenian side, shows the pre-planned nature of the offensive.